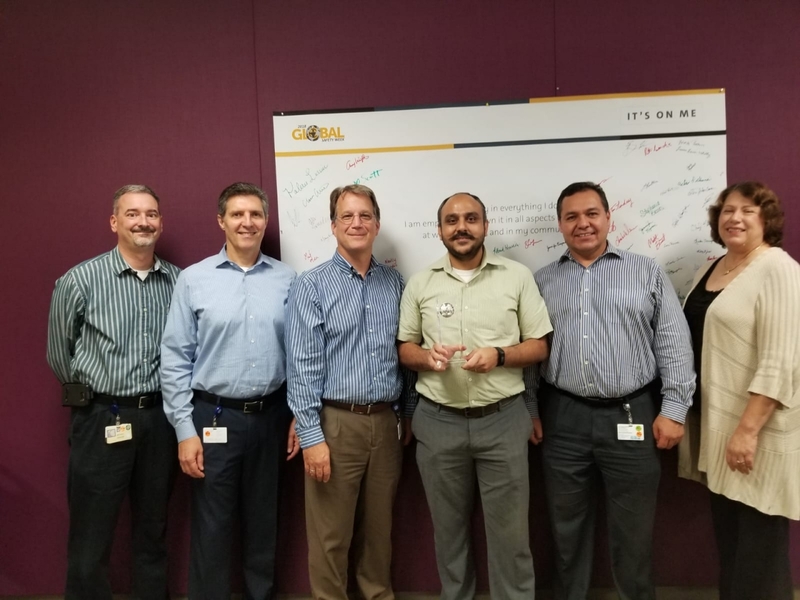 GM’s Global Logistics & Process Oversight, and GPSC Compliance team: Michael Henisse; Edgar Pezzo; Tom Ramos; Vijay Bharadwaj; Miguel Tavera; and, Marilyn Smith. General Motors North America was recently awarded the 2018 SmartWay Excellence Award, the Environmental Protection Agency’s (EPA) highest honor for leadership in freight performance. The award recognizes the top two percent of SmartWay Partners with superior environmental performance. This year, GM is the only original equipment manufacturer (OEM) represented on the list. A key part of our holistic approach to minimizing our impact is identifying the right partners to help us move closer to our vision of a world with zero emissions. Our partnership with the EPA SmartWay is a great example of this. Since 2013, we’ve worked with the organization to find ways to cut emissions from our freight shippers and carriers, ultimately reducing our carbon footprint. Between 2015 and 2017, we have saved more than 224,600 tons of carbon emissions – the equivalent of growing 5.8 million trees for 10 years – through our efforts. Collecting data to reduce emissions: We launched our frequency project three years ago with the intention of collecting data from our shipping activities to maximize efficiency. Today, we track shipping activity, including the carriers we use to ship freight, the number of miles traveled, and the freight weight. Combining this information with carrier data, including equipment and service type, allows us to develop plans to further reduce carbon emissions. We have used this data to reduce the number of trucks that are in our network which leads to a reduction in miles, congestion and emissions. Turning off trucks: We work with our manufacturing plants to make sure everything runs as efficiently as possible. When a truck arrives at one of our facilities, instead of keeping them running, we have a process in place to ask carriers to turn off the trucks and hand over their keys. This process of making sure trucks are not running idly every time they arrive at a GM facility helps reduce our environmental impact. Engaging the industry: We are committed to localizing our supply chain and sharing best practices. We do so through forums, such as Suppliers’ Partnership for the Environment, the Automotive Industry Action Group and the EPA ENERGY STAR® program. We see industry collaboration as crucial to reducing emissions and congestion. By working together, we can help identify areas of improvement, reduce miles driven and increase overall efficiency within the industry. We’ll continue to improve in this space and advance our leadership in freight performance by focusing on energy efficiency and leveraging our innovative mindset across our facilities and supply chain. We hope to make improvements by working with suppliers that are closer in proximity to our operations and leveraging technology to drive efficiencies. To learn more about the SmartWay awards, click here. For more information about our supply chain and sustainability efforts, click here.